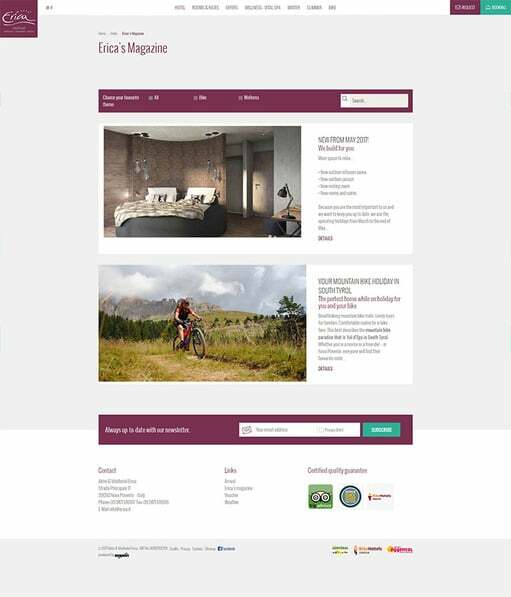 Our client, the Vitalhotel Erica in Deutschnofen, has approached us for the second time now with the wish to create a new website. The hotel is located in the middle of the natural heritage site of the Dolomites and stands out as a bike hotel primarily through its offer for cyclists and through the Wellness and Vital spa. The landlord, Luis Brunner, himself a passionate mountain-biker, gives his guests the best secret tips for tours in the area. Along with guided tours, the hotel offers anything the cyclist’s heart desires. Health and feeling well are emphasises in the Hotel Erica. From relaxation in the water and sauna world, through health-promoting treatments, up to special programmes for the benefit of you and your health. Concept, design and realisation of the responsive web-site. Inclusion of a quick enquiry to increase the number of enquiries. 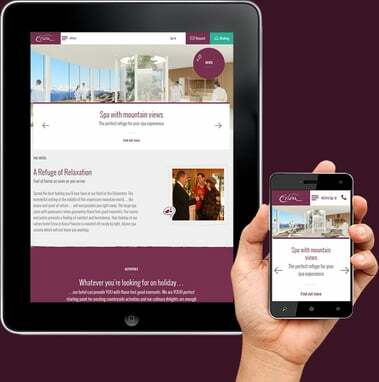 The client uses our sales tool ReGuest, to turn more enquiries into bookings. Inclusion of a last-minute pool, to fill empty rooms even at short notice. Implementation of our PRO-System to present prices, rooms and offers optimally, pass on any information needed to the guest and so increase the conversion rate. Inclusion of the logos of ratings portals as a trust element to build trust among visitors. Its own magazine which communicates news about the hotel and arouses curiosity. Prominent placement of the USPs, Wellness und Bike, in the menu points and on their own landing pages. The hotel is one of the first to use our sales and marketing CRM, Amplifier. Use of our newsletter-tool to connect with customers.